At McMaster, my primary teaching and advising interests are in comparative social policy, comparative politics, and Latin American politics. At the undergraduate level, I regularly offer a second year lecture course on politics in the developing world (2XX3) and a fourth year honors seminar on the politics of public policy. At the graduate level, I regularly teach the core seminar in comparative public policy (783) and a graduate introduction to statistical analysis for public policy (784). At Georgia Tech (2002-09), my primary teaching responsibilities in the core undergraduate and graduate curricula included required courses in graduate/undergraduate International Political Economy, graduate Empirical Research Methods, Latin American Politics, Latin American Political Economy, and Globalization (among others). My teaching philosophy emphasizes the promotion of active learning, critical thinking, and development of writing and communication skills. I also use web-based course discussion tools and weblogs in teaching. Based on my experience using weblogs to promote critical reading, thinking, and writing skills, I’ve offered a workshop on using weblogs in the political science classroom and maintain a webpage with resources for faculty interested in teaching with blogs. A complete list of my course offerings can be found below, or you can look at a summary list of my teaching and evaluations. 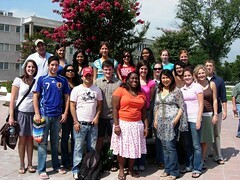 In 2007, I also developed a new summer study abroad exchange program at the Instituto Tecnológico de Monterrey in Mexico. That year, I took the first group of 15 Georgia Tech students to Monterrey; the group included six freshman, six non-INTA majors, and four students from underrepresented minority groups. As a Visiting Professor at Monterrey Tec, I taught a Mexican politics course enrolling both Georgia Tech and Monterrey Tec students, providing for true cross-cultural education and exchange. The students maintained a weblog on contemporary Mexico during the program for class. If you are a student trying to decide whether to register for one of my classes, check out my course evaluations for selected courses below. Keep in mind that all course surveys are conducted online and therefore, you don’t get an unbiased sample of students. Students with extreme opinions (both positive and negative) are usually over sampled. Summer study abroad at Monterrey Tec.